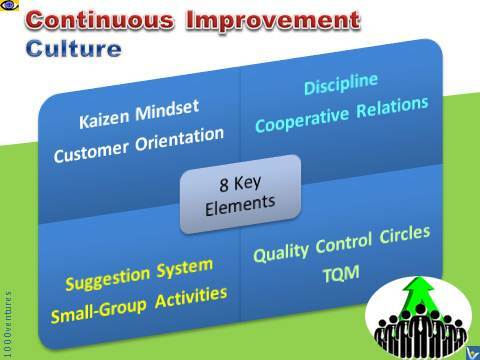 → Kaizen Mindset: sets the right environment of never-ending efforts for improvement involving everyone in the organization – not a single day should go by without an improvement made somewhere in the value chain. Customer Orientation: customer satisfaction first, not → profit first. → Customers are both people in the next process and end-users of the final product. Discipline in the Workplace: includes both improving skill and training as one of the primary tools that can apply to everyone involved to achieve long-term gain for the organization. Suggestion System: most of the suggestions that have great economic impact come from groups, while individual-based suggestions serve as morale boosters and educational experiences. Small-Group Activities (SGA): a method for → problem solving in small groups by structurally searching for the root causes and eliminating them. The group is also taught → communication skills, → decision making and working in → teams in order to use each other's knowledge and experience. Quality Control (QC) Circles: an employee participation program focusing on making improvements in the workplace, specifically in such areas as cost, safety and productivity.